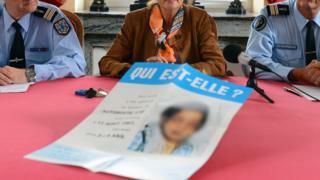 French police have arrested a couple 31 years after their daughter was found dead, in a cold case revived through DNA evidence. The mutilated body of the child, named by police as Inass, was found by a motorway in central France in 1987. The parents were traced after the DNA of their son, tested in an unrelated case, was matched with that of the girl, French media report. Authorities say the parents are now under formal investigation. Inass's body was found in a ditch along the A10 motorway near the city of Blois in August 1987, clothed and covered in a blanket. In a news conference on Thursday, Blois prosecutor Frédéric Chevallier said her parents, now aged 66 and 64 and named as Ahmed and Halima Touloub, were under investigation for the crimes of murdering a minor, violence against a minor and concealing a corpse. The two separated in 2010, and were arrested at their separate homes on Tuesday morning. Mr Chevallier said the girl was born on 3 July 1983, and so was four years old when her body was found. She was born in Casablanca in Morocco and initially lived with her maternal grandmother before joining her parents in late 1984 or early 1985. According to the prosecutor, Mr Touloub told police on his arrest that his wife had been violent to him and their children, and that they lived under "her rule". He spoke of his "relief" that the case had been reopened, Mr Chevallier said. He told authorities he had found Inass dead after returning from a trip to Morocco, and that her body was then abandoned by the side of the road. The mother, however, claimed it was her husband who had been violent. She also admitted "occasionally" being violent to Inass but insisted she was not involved in her death, Mr Chevallier said. When Inass's body was found in 1987, the authorities were unable to identify her and all physical evidence found with the body was preserved. Her body bore marks of horrific, long-standing abuse, including human bite marks, broken bones and burns with an iron. Parts of her body were mutilated. The investigating magistrate in Blois who was in charge of the case at the time said that it was "practically a case of cannibalism with flesh being removed". Nicknamed the "little martyr of the A10", her body was never claimed and her disappearance never reported. She was buried in an anonymous grave. At the time, the murder sparked one of France's biggest ever investigations, with the girl's photograph posted in public places and an alert sent to more than 30 countries. Some 65,000 schools were visited at the start of the school year, and 6,000 doctors or childminders were contacted to try to find the victim's name. The case baffled police for years. It was declared unsolved in 1997. Can we still rely on DNA sampling? In 2008, her DNA was formally identified, and the related information registered in a national genetic prints database. However no identification was made at that stage. The case was reopened in 2012 when a call for witnesses was released with a picture of the dead girl's face and the caption: "Who is she?" The apparent breakthrough in the case happened when a man was arrested over a violent incident in 2016. His DNA reportedly identified him as the victim's brother. Months of investigation then led police to the parents. Can police rely on DNA sampling?